After several years of promising myself I would make the trip to see the snakehead fritillaries (Fritillaria meleagris) in Wiltshire, I finally made it this year. Looking into the best sites as well as the best time to do with the weather I picked my day, got up super early and headed off. On arrival in the car park it was just a few degrees above zero and everything was covered in a thick blanket of dew, these were very much the conditions I was hoping for so set of for Upper Waterhay. Upper Waterhay is owned and managed by Wiltshire Wildlife Trust after being purchased in 1970 and is one of only a handful of strongholds left of this beautiful flower and uniquely here the majority of flowers are creamy white rather than the normal crimson colour. 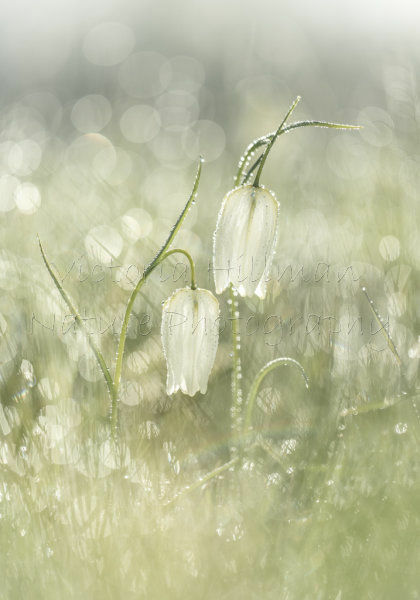 Nothing could have possibly prepared me for the sight that I was greeted with on entering the meadow, fritillaries are far as the eye could see bathed in a blanked of dew and soft early morning light, perfect, except for a few moments I just didn't even know where to begin. It didn't take long and after dropping to the ground, being very careful not to put any of my equipment or self on any of the flowers, the ideas started flooding in. 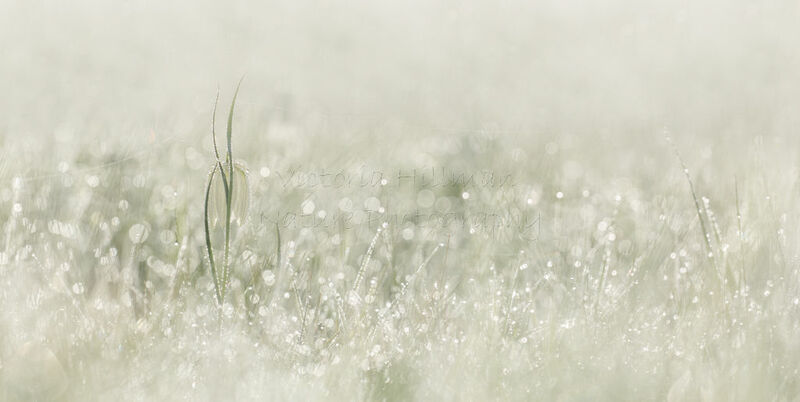 First up are some dreamy images of these stunning flowers in amongst the dew. Once the sun was up, the dew didn't last long but I found a small area of meadow still in the shade which provided the perfect darker backdrop for some rim-lighting and higher contrast images. 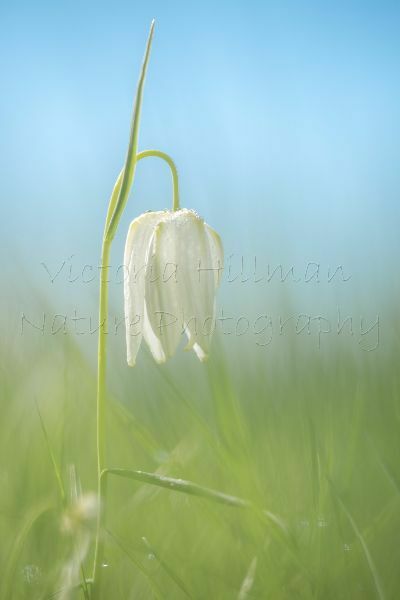 I spent a wonderful few hours in the meadow and just as I was packing everything up ready to head back to the car, I noticed this single white flower with the greens of the grass merging beautifully into the blues of the now clear blue sky. Back at the car I decided rather than heading straight home I would pop to Lower Moor farm (also owned and managed by Wiltshire Wildlife Trust) to see what I could find there since it was such a beautiful day. There were a few fritillaries around, and a fair few green winged orchids too, but many of them were already over their prime flowering period with some missing petals. For many people they probably wouldn't give these a second look let alone photograph them, but they provide interesting compositions particularly in black and white. I had the most incredible day and I couldn't have asked for better weather, I am already thinking about next year. 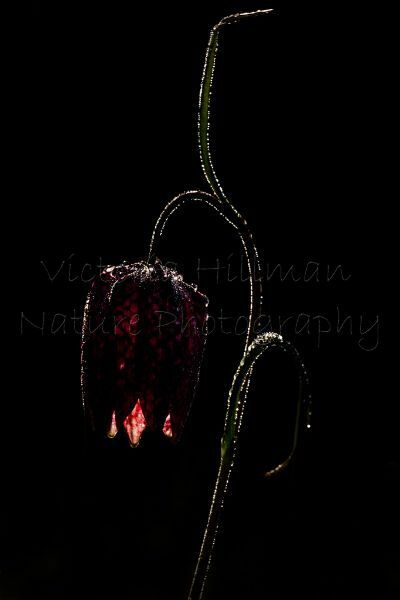 But the snakeshead fritillaries in these numbers only survive in a handful of protected areas now after being so abundant at one time they would be collected and sold as cut flowers on the markets in London. But a combination of meadows being turned over to farming and drainage many of the meadows have now been lost with the exception of a few protected sites. For me they are a wild flower that doesn't get all that much attention but are possibly one of the most beautiful that we have here in England. I would urge anyone if you have the chance to go to one of the meadows and see the spectacular displays for yourself, but please be careful not to walk on, place bags on or pick these beautiful flowers. I'm going to end this post with a wider angle view of the flowers dancing in the breeze.